Just 35Km away form the hotel FILOXENIA is the city of Thessaloniki. Thessaloniki is a large modern city-port, with over 1 million inhabitants, and is the largest urban center in Northern Greece. 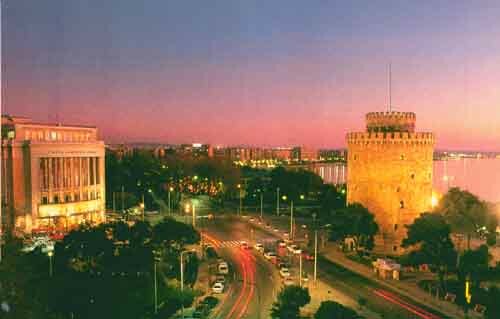 Thessaloniki is a city with urban life continued for more than 23 centuries and its strategic position has established the city as one of the most important crossroads of the region. Nowadays, the city is growing rapidly and aspires to play a key role in the wider Balkan region. The city of Thessaloniki was founded in 315 BC by the King of Macedonians, Kassandros, who was placed to manage the city by Alexander the Great. Kassandros, having dominated the battle against his successors, he married Alexander’s the Great stepsister, Thessaloniki, from whom the city took after its name. The city is a hub of culture and this is reflected by the archaeological sites, the Byzantine churches and other interesting monuments. You can feel the spirit of the city by walking alongside the coast from the Port up to the White Tower, which is the symbolic monument of Thessaloniki. You can relax with a coffee overlooking the Thermaikos Gulf and experience the city’s tradition by walking in the small stone-paved streets of the old market. For your drinks there are numerous bars in the city center and the east side of the town. You can go shopping in the fashionable center of Thessaloniki, but also visit the largest mall of the Balkans, Mediterranean Cosmos at the east side of the city.